John Waugh was my great grandfather. He is seated in the photograph on the left. (no idea of the names of the other men). 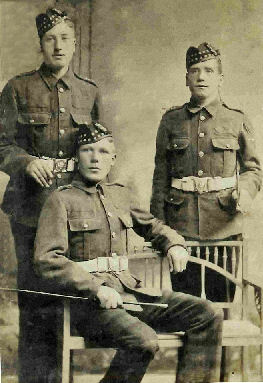 He joined the Royal Scots Fusiliers in 1910 and was discharged in 1917 after losing a leg. He was born in November 1892 at Welltrees Square, Maybole. His brothers and sisters were born in various parts of Maybole (Coral Glen, Weavers Vennel, Welltrees Street, Kirkport). They seem to have moved about a lot!